The Bernese mountain dog is an overall healthy dog with some disposition to certain joint ailments. Bernese mountain dogs are loyal family dogs offering plenty of energy and love. However, some significant health problems are associated with these big colorful canines, mainly because its owners tend to be progressive in reporting ailments. The bulk of dogs do not develop challenging illnesses. According to ongoing studies supported by the Bernese Mountain Dog Club of America, nearly 10 percent of dogs belonging to this breed develop cancer in their lifetime. Most are diagnosed in their sixth year of life. 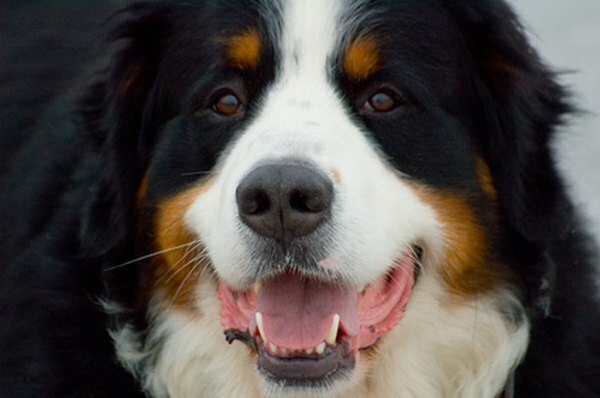 The two most common forms of cancer found in Bernese mountain dogs are histiocytosis and mastocytoma, both of which attack the dog's immune system. The first causes an elevated white blood cell count and the second causes tumors to develop all over the dog's body. Both of these cancers develop in animals with certain genetic markers, giving researchers some hope that through breeding programs, they can be eliminated. The dog club has begun a tumor registry to track affected individuals. Known by veterinarians as "gastric torsion," this painful ailment isn't always the easiest to detect, as its symptoms are characteristic of other disorders. Dogs experiencing this tummy trouble are agitated, drooling much more than normal, breathing heavily, trying to vomit and often pacing nervously. The abdominal region may be bloated. The stomach has become flipped over, trapping the gases being produced through digestion. It is a life-threatening situation, as circulation to the stomach and spleen is cut off completely, and veterinary intervention through surgery is a necessity in most cases. This issue actually begins in puppyhood but often isn't fully expressed until the dog's older years, when time and bone wear begin to reveal the arthritic condition. An abnormal formation of the hip joint during the pup's growth causes the head of the femur bone to fit improperly in the hip joint. The result is unnatural wear and tear resulting in arthritis. In its older years, the dog may be slow to get up or may resist climbing activities. Joint medications prescribed by a veterinarian can alleviate the discomfort. In veterinary terms, this condition is known as progressive retinal atrophy. It is an irreversible loss of vision that in the case of Bernese mountain dogs (and some other susceptible breeds) is genetically linked. While this affliction of the retina itself is not painful, it also is currently untreatable. It begins with a worsening of the dog's nighttime vision, progressing to night blindness and eventually total blindness.